The first time when I have heared that Germany makes its own cheese I was very curious, I couldnt believe this. On my third visit in Allgäu (south west part of Bavaria, on the Austrian border), I have dicided to give it a go. We went to Apine dairy shop where we took a tour. As soon as we walk in we could smell the aroma of cheese. Cheese from German Alps – Allgäu – is very different to what we buy – its made of hay-milk. In order to produce the hay-milk baverian farmers feed the cows with grass or hay (in winter) from the pastures that are placed over 700 meters. The grass from this pastures gets more sun and has more aroma. This particular Alpine dairy shop cooparates with 9 different farms. Each farm is allowed to have maximum 40 cows – there is no more grass to feed more of them. Well, it just makes the apine cheese more special. I went out of this class with 15 different cheeses and trust me, our caravan smelled really badly (so my husband said). I enjoyed the smell! Out of those 15 different cheeses and have chosen 5 for you. Most of them you can get in big supermarkets all over the country, so you don’t have to go to Bavaria (although i would if I were you:)). Allgäuer Bergkäse is made from raw milk of cows grazing in the Allgäu Mountains in Bavaria. It has really strong aroma and spicy flavor. The longer it ripens the stronger it tastes. The youngest Allgäuer Bergkäse ripen 4 months. It’s texture is crumbly and firm and its color pale yellow. The cheese contains 62% fat. This particular cheese is seasoned from outside with the mild mix of gras and herb seeds which gives this cheese unique aroma. The cheese is made out of cows milk and it contains at least 32% fat. It has crumbly and compact texture and creamy taste. It has to ripen at least 3 months. While eating it I had a feeling I taste the freshness of the German apine countryside. As the name indicates – red wine cheese is treated with red wine before landing on the shop shelves. The alpine diaries use the wine to produce this cheese differently. Some of them after the cheese is ripped place it for 2 days up to 2 weeks in container filled with red wine, some of the treat it with the red wine while ripping. The cheese becomes in this process a red rind and is ready for consumption already after 8 weeks. It has a creamy taste and very delicate specific aroma. It contains at least 48% fat. I have discovered this cheese actually very recently, I think thats the newest product of our favorite dairy shop. The cheese contains many different herbs – what exactly – its apparently a secret. It has really strong herb flavor and I found out that the green color comes from spinach which is natural food coloring. 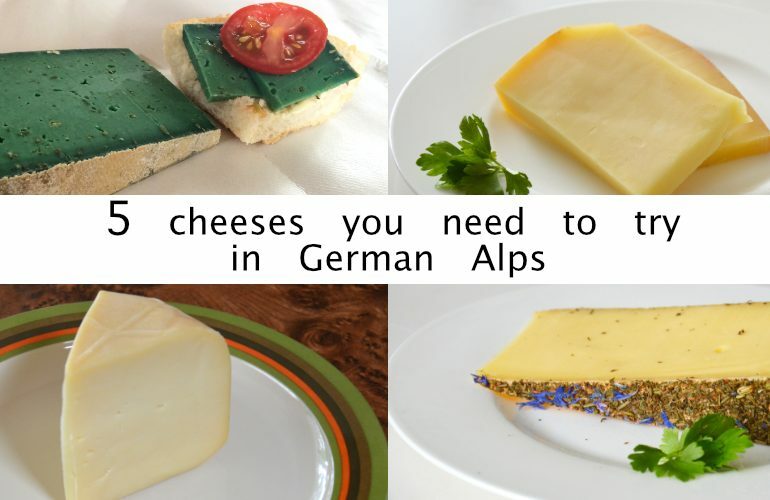 If you are going to German Alps you cannot miss trying the cheese in this area! Hay-milk gives the apine cheese very specific, amazing taste which you won’t find anywhere else (even on the other side of the Alps;).